Step it Up! Series – Make a Sunshine Dress without Sleeves Pattern Hack – Oh Sew Kat! Make a sleeveless shift dress for your 18 inch doll with this easy pattern hack. Don’t you just swoon every time you see one of those cute sleeveless sundresses made by Lily Pulitzer? I mean, how cute is this? This adorable dress is basically exactly the same as my new SUNSHINE DRESS pattern. WANT A SIMPLE PATTERN HACK???? With a few simple adjustments, and the right fabric, even a beginner can create this same look! Here’s my version using Vera Bradley fabric. Read on to see how easy it is to step up my simple SUNSHINE DRESS pattern to a super trendy look! Want to simply buy the dress? Hop on over to my ETSY SHOP and scoop it up before it’s gone. These dresses are going to be available in very limited quantities. Tutorial: How to make a cute sundress from the Sunshine Dress pattern by Oh Sew Kat! 1. Choose your fabric and cut out the following pattern pieces: 1, 2, 3, 4. (back, front, lining back and lining front. If you want to use princess seams, use the pieces the pattern specifies for that view instead of piece 2 (front).) 2. To make my dress, I used luncheon sized napkins I bought at the Vera Bradley outlet. (Yes, Virginia, there is a such a thing, and yes, it is truly amazing!). The napkins have a bound edge, and I decided to use that as my dress hem. The pieces just barely fit! I used two of my four napkins to make this one dress. It’s a little shorter than the pattern piece by about an inch, which okay, as I want a shorter sundress. 3. Follow the pattern instructions and sew the shoulder seams of both the dress and the lining. Finish the bottom edges of your lining before you attach it. Line the pieces up with right sides together, pin, and sew the neck and sleeve edges. 4. Carefully pull the back pieces through the shoulders to the front, flipping the pieces inside out. If you’ve never done this before, see my TUTORIAL. To make it easier, use a FASTURN set (*affliate link – Tutorial here). Press for nice smooth edges. With RST, line up your side seams, opening out the bodice pieces as well, and sew one long seam from the hem of the dress to the hem of the bodice lining. Fold the insides together and press if needed. Finish the back edges and hem according to the pattern directions. I skipped the hem part, as mine was already finished! That made this quick project even quicker! 5. Once my dress was done, I added the pink sparkles (from the craft store) with my iron to complete the look. Ta da!! I used a dress pattern I already had on hand, to create a trendy look by leaving off the sleeves and shortening the length a little bit. With a little imagination, a simple little pattern can go a long way! I can’t wait to see what you sew!! Post your Sunshine Dress on social media with #ohsewkat! See more Sunshine Dress tutorials HERE and HERE. Make a sleeveless doll dress for 18 inch dolls from any dress pattern with this easy hack. 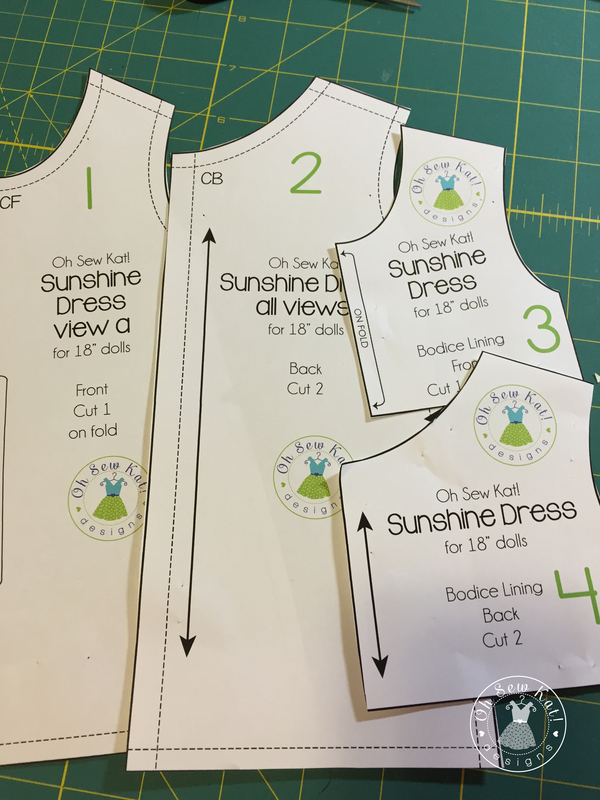 Pingback: Animator Sized SUNSHINE DRESS is now available… | Oh Sew Kat! Pingback: Easter dresses – Oh Sew Kat! Pingback: It’s Tester Tuesday! Sunshine Dresses for Wellie Wishers. – Oh Sew Kat! Pingback: Who wore it best? Sunshine Dress for Dolls – Oh Sew Kat! Pingback: Tester Tuesday! School Dance Dress for WellieWishers dolls. – Oh Sew Kat! Pingback: Step it Up Series: Simple, Hawaiian MuuMuu for Nanea with the Sunshine Dress Pattern – Oh Sew Kat!